Today, in the majority of high production soldering of electronic component applications, belt furnaces are used. The typical length of a belt furnace exceeds 20 feet. Some of these high volume production processes require <200 ppm oxygen level, a nitrogen flush (to achieve such a low ppm oxygen level) and constant “power on” that keeps the oven heated at all times. This process significantly increases the costs of operation as compared to a vacuum reflow oven system. In addition, belt furnaces are known to produce a significant amount of voids - as much as 40% - within the solder joint, which decreases long-term reliability of electronic components. In contrast, vacuum reflow oven systems have shown to significantly reduce void levels of all types of electronic components, typically to <5%. This is a significant reduction in void levels. As a batch process system, a vacuum reflow oven system only operates when needed. No constant heating and nitrogen gas flow is needed, which decreases cost of operation. Most importantly, uniquely in our industry, SST vacuum reflow oven systems use vacuum, pressure, temperature and force to collapse voids in order to produce near-void-free components for many types of electronic applications. Uniform distribution of weights (force) applied to parts during the reflow process helps in the reduction of void levels, unlike what is seen in a typical belt furnace process. In addition, SST vacuum reflow oven systems have a considerably smaller footprint than belt furnaces. Like belt furnaces, SST vacuum reflow oven systems are capable of processing sintered materials and brazing components but also offer a variety of options in the soldering of electronic components for many types of applications. Such applications include die-attach, lid-seal, gyroscopes, MEMS packages, IR sensors and printed circuit boards. SST vacuum reflow oven systems offer uniform distribution of heat in the forms of radiant and resistive heating These methods of heating ensure that all the material components are being heated uniformly from all sides during the reflow process. SST vacuum reflow systems can be equipped with a formic acid delivery system and/or flux trap capability in order to obtain proper wetting onto mating surfaces. Formic acid reduces surface oxides which in turn increases long-term reliability of solder joints in electronic component parts. The above processes have been shown to decrease the void levels of all types of products sealed and/or processed in our oven systems. The reliability of the packaged parts in an SST vacuum reflow oven system combined with low cost of ownership (which includes initial investment as well as operating costs of utilities and maintenance) are key differences between belt furnaces and vacuum reflow oven systems. Advice as to the best materials, process and system to use to achieve desired results. Customized design and fabrication of SST tooling crafted from semiconductor grade graphite. An optimized solder profile which increases long-term reliability and performance of customer electronic components. Use of actual customer parts to produce <5% void levels in die attach application and demonstrate results via X-Ray or CSAM analyses. Lid seal applications are verified by Fine Helium leak tests followed by Gross Bubble tests as per Mil-Spec 883. Successful completion of a project in the shortest time. Enhanced ROI by ensuring your system is ready to produce from the day it is installed. Figure 1. Here is a QFN produced in a belt furnace. 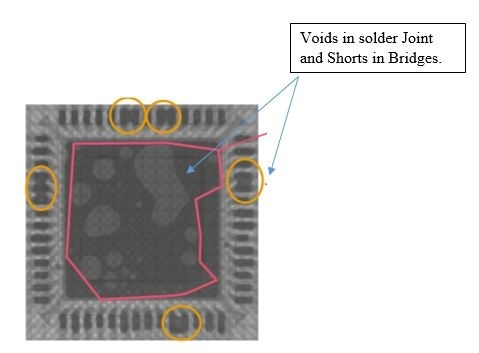 There is a high volume of voids in the solder joint. 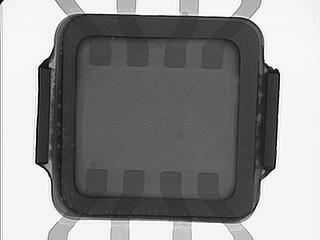 These voids decrease long-term reliability and performance of microelectronic devices. Figure 2. Here is a lid seal (empty package) component processed in an SST Vacuum Reflow Oven System in which a near void-free sample part was produced. There are no visible voids in the solder joint or seal ring, thus providing long-term reliability and enhanced overall device performance.